A bill that will put an end to the need for getting permission to transport bamboo was introduced in the Lok Sabha on Monday amid protests from Biju Janata Dal (BJD) MP Bhartruhari Mahtab. As Environment and Forest Minister Harsh Vardhan stood up to introduce The Indian Forest (Amendment) Bill, 2017, Mahtab raised objections. The bill would do away with the inter-state permit for transportation of bamboo. "Very innocuously it is being mentioned that farmers are being affected," he said. "How can you take away power from states... Whose interest are you protecting? You are protecting interest of the trader," he said. Vardhan, however, denied it. "I think the member has not understood the bill. His apprehensions are grossly misplaced. This is one of the major reforms and it is going to help farmers and everyone in a big way," he said. 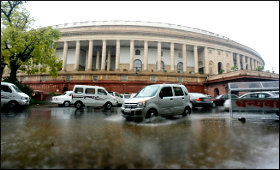 The bill was then introduced in the Lok Sabha. Other bills introduced by the government amid the uproar included The National Council for Teacher Education (Amendment) Bill, 2017, The Payment of Gratuity (Amendment) Bill, 2017, The Dentists (Amendment) Bill, 2017 and The Representation of the People (Amendment) Bill, 2017.